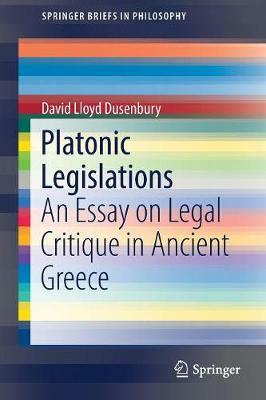 This book discusses how Plato, one the fiercest legal critics in ancient Greece, became - in the longue duree - its most influential legislator. Making use of a vast scholarly literature, and offering original readings of a number of dialogues, it argues that the need for legal critique and the desire for legal permanence set the long arc of Plato's corpus-from the Apology to the Laws. Modern philosophers and legal historians have tended to overlook the fact that Plato was the most prolific legislator in ancient Greece. In the pages of his Republic and Laws, he drafted more than 700 statutes. This is more legal material than can be credited to the archetypal Greek legislators-Lycurgus, Draco, and Solon. The status of Plato's laws is unique, since he composed them for purely hypothetical cities. And remarkably, he introduced this new genre by writing hard-hitting critiques of the Greek ideal of the sovereignty of law. Writing in the milieu in which immutable divine law vied for the first time with volatile democratic law, Plato rejected both sources of law, and sought to derive his laws from what he called `political technique' (politike techne). At the core of this technique is the question of how the idea of justice relates to legal and institutional change.